Thank you for choosing our KidStuff Coupon fundraiser! Your school sells KidStuff Coupon Books for $25 and earns $12.50 profit! Our NEW KidStuff Coupon App is included with every KidStuff Coupon Book purchased! We give your school KidStuff books to send home with your students...Families ♥ having the opportunity to see how quickly they will save more than the $25 cost! 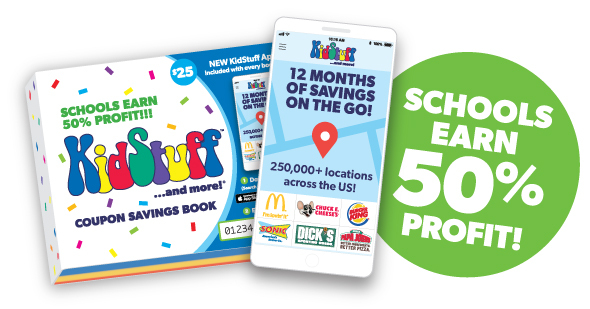 With our New KidStuff Coupon App, families can use even more local and national coupons while they shop, play and eat close to home or when traveling! We provide everything you need to have an easy, organized, successful fundraiser! Please submit this agreement to reserve your books even if it is incomplete. We will be in touch to update it later. We love to help make your fundraiser a success! Please call 888-404- 5437 with any questions! This is the information that we have for your school. If this is not correct, please update the information before continuing. Books are available for immediate shipping. We recommend a two week sale. What is the date money and orders are due from your families? This date will also be on your parent instruction letter. Schools sell more books by sending home with each student. How are you sending books home? How many books do you need to send home? Most schools have books and supplies shipped to the school. Where would you like to have your books and supplies shipped? We supply one parent letter for every book you are sending home plus a few extra. If you need a different amount of letters, please enter that number in the box below. Do you want payment with other options such as cash, money order, or do you have information about paying electronically through your school? Please enter this information in the box below. What contact information for the above contact would you like printed on the letter? Is there an additional person that parents should contact with questions? What contact information for the above additional contact would you like printed on the letter? KidStuff will pay $12.50 profit for each book sold with your school code in our NEW ONLINE STORE! Who should the checks be made payable to? KidStuff Coupon Books 2019 must be sold for the full price of $25.00 and our NEW KidStuff Coupon App is included with every book sold! Your school earns a 50% profit of $12.50 PER BOOK SOLD including books sold in the KidStuff Online Store!! No up-front costs and no risks. KidStuff Coupon Books are provided on consignment to SEND HOME with students/families! KIDSTUFF DOES NOT CHARGE FOR MISSING OR DAMAGED BOOKS! An individual student/parent earns 1 FREE book worth $25.00 for every 5 books he or she sells! KidStuff pays for shipping for the delivery and return of books. With KidStuff’s approval, you may keep books on consignment for additional sales. Unsold books may be returned only after making arrangements with KidStuff. Book sales should start and end within a 2 to 3-week time frame. After the end date of your sale, additional book orders are usually shipped within 5 business days. Purchasers of KidStuff Coupon Books make payments to your school’s fundraising organization or in our KidStuff Online Store. Schools pay KidStuff only for books sold. Payment to KidStuff for all books sold is due within 30 days after the start of your sale. Payment for any additional books sold after your first payment is due within 90 days of the start of your sale. No personal checks will be accepted. Your school’s fundraising organization makes checks or money orders payable to: KidStuff Coupon Books. NEW ONLINE STORE! Your school families can pay for their books sent home and purchase additional books in the online store. Families can also share their Seller Link to sell books in the Online Store and receive credit. Purchasers can pay a small shipping fee to ship to an address or purchasers can choose "Pick Up from Seller” and you will send these books home at the end of your school's sale with your students. Money collected through sales online will be reconciled with money collected at the school at the end of your sale. KidStuff’s goal is to help all schools raise money; therefore, KidStuff does not offer an individual school exclusivity within a school district or geographic area. KIDSTUFF DOES NOT PROMOTE DOOR-TO-DOOR SALES BY CHILDREN. I have read the KidStuff Coupon Books Participation Terms on this form and I agree to these terms. Please keep me up to date with information on future KidStuff fundraising opportunities.